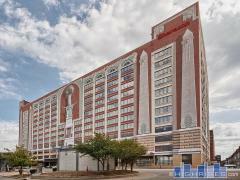 Ely Walker Lofts of St. Louis, MO | 1520 Washington Ave.
Ely Walker Lofts feature 29 different floor plans to choose from with great architectural details like refinished hardwood floors, huge windows, high ceilings and exposed ductwork and pillars. The Ely Walker also features a professionally designed lobby, rooftop deck, club room and fitness center. Have any comments or questions about Ely Walker Lofts? Ask your question and/or share your thoughts about this Building.